Basil, Ocimum basilicum, is part of the Lamiacae family and the genus Ocimum. This family of plants also holds many herbs including mint, rosemary, lavender, patchouli and many more. The most common basil essential oil is sometimes referred to as sweet basil as there are a couple of chemotypes that are used to make essential oils. Sweet basil is a linalool type. Linalool is one of the main ingredients of lavender, so this basil with have a softer scent and be more soothing and calming. I have a basil essential oil that is a chavicol chemotype (methyl chavicol), which is slightly spicier and more camphorous in scent. I would use this with a client in a treatment blend if I wanted a warmer more stimulating blend. I would use the linalool type for a more relaxing blend, and I tend to use the sweet basil more often. Basil takes its name from the latin ’Basileum’ meaning royal. 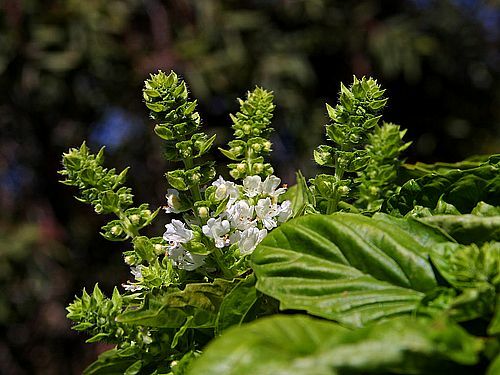 It is also considered a holy plant of India used in Ayurveda and dedicated to Vishnu and Krishna. This Indian basil is a different plant and is called tulsi, Ocimum tenuiflorumi. One of my suppliers now offers this as an organic essential oil but I haven’t smelt it yet so I’ll have to get back to you on that. There are some great tulsi teas on the market – they don’t taste like the sweet basil, just a soft lovely herb. 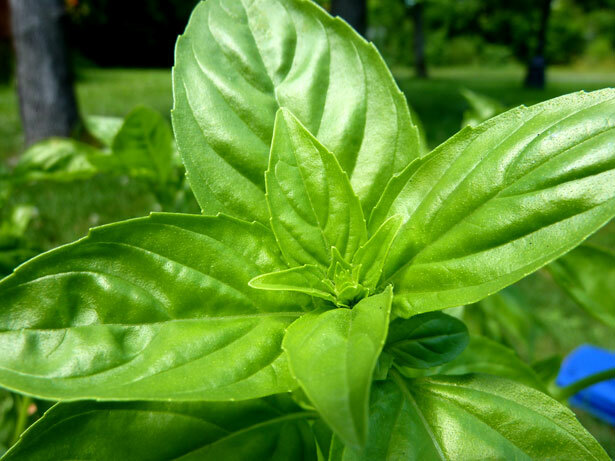 Sharp and spicy (yet sweet), basil helps clear the head and open the mind. It is referred to in aromatherapy as a “cepahilc” oil, which means pertaining to the head. It is a very powerful clearing oil, particularly effective when used in a vapouriser as an inhalation, or even when you are cooking! Making a fresh basil pesto is enough to make you feel refreshed and alive – especially when you use a mortar and pestle. 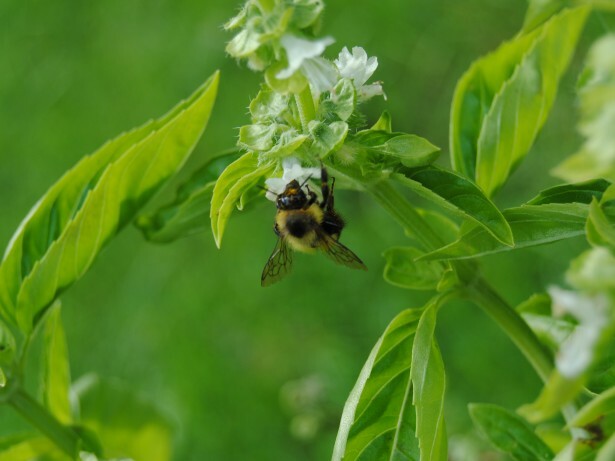 Basil is alluring – even to bees! Basil essential oil is used for mental and physical fatigue and its anti-spasmodic properties make it ideal for treating menstrual problems and digestive disorders too. * Sinus congestion, asthma and bronchitis are all soothed by basil. * Fever can be treated effectively with basil. So when you are feeling like you need some energy try basil oil for a quick pick-me-up. I’ll follow up with some recipes in the next article, but in the meantime buy a fresh bunch of basil instead of flowers and make sure you inhale the fragrance deeply. Get cooking with some basil and when you do, crush up a leaf in your fingers and allow the cooling fragrance to open your mind! This entry was posted in Aromatherapy & Cooking, Essential Oil Profiles, Essential OIls and tagged abundance of nature, aromatherapy, basil essential oil, clear your mind, consciousness, daily ritual, essential oils, essential oils for a headache, essential oils for coughs and colds, essential oils for digestion, essential oils for energy, essential oils for happiness, essential oils for sinus congestion, essential oils for stress relief, essential oils for the crown chakra, essential oils for third eye chakra, essential oils to combat fatigue, essential oils to inspire creativity, essential oils to stimulate the mind, health, intention, natural scents, scent by suzannerbanks. Bookmark the permalink.